You may have seen Brooks Falls on television. 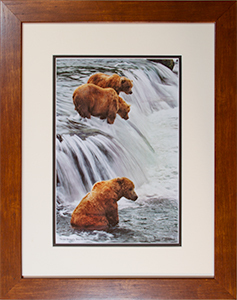 That is where they show these bears grabbing salmon right out of the air. 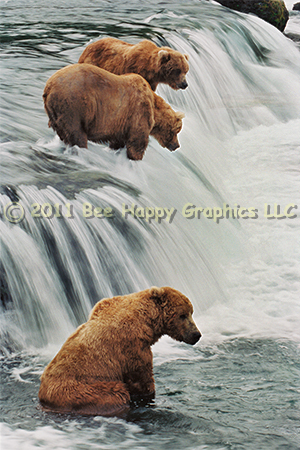 Katmai National Park is on the Alaska Peninsula north of Kodiak Island. You have to take a plane from Anchorage to King Salmon, and then a float plane to Brooks Falls. The best time to go is in July, during the salmon run. We were leading our Sea Scout group on another extended camping trip from Miami. The big boars stake a claim at the falls itself. We’ve seen as many as fifteen there at one time. 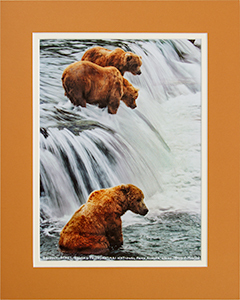 Younger males hang out downstream, and mothers with cubs are frequently at the mouth of the river. Fine Art Paper 17" x 11" 24" x 16"
Canvas N/A 33" x 22"